This rental unit, 2-D at Fenimore Mill can be purchased completely furnished for $260,000.00. It is a Top Rental Unit and the proceeds can be used to offset your ownership costs. Please contact Bob Cooper at 1-800-767-8354 for details. 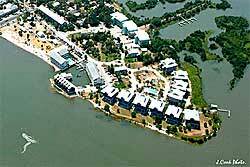 Enjoy waterfront vacationing at it’s best in Cedar Key, Florida. Come stay in our lovely condominium unit (unit 2-D) where you will find a beautifully furnished two bedroom,two bath condo with a large balcony facing the Gulf of Mexico. We have unparalleled views of the Gulf of Mexico and Islands of the Nature Coast….and it includes a 1000-foot private beach. Seagulls and pelicans greet you off your deck, while sandpipers play on the beach, and dolphins entertain you in the gulf. Your goal may be to	simply relax in our condo and enjoy the pool and whirlpool, or bird watch on the trails you will find in the Nature Coast area. You can also shop at the historic (1860s built) downtown area or the shops on the dock. 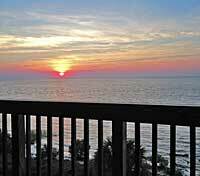 The fishing is fabulous in the Gulf of Mexico, and canoeing, kayaking and cycles are available. So come enjoy the tropical beauty of Cedar Key, Florida.